Boyne Highlands has it all when it comes to the perfect Northern Michigan winter getaway. Offering great snow, expert grooming and carved out glades, skiing and snowboarding at Boyne Highlands is non stop fun. Located just outside Harbor Springs across the valley from Nub's Nob, there is a 552-foot vertical drop spread over 270 acres with plenty of lodging at the base. Ski or ride day or night. There's a 500-foot halfpipe for snowboarders a high speed quad chair lift to help serve their 430 skiable acres. The Austrian-American Snowsports School offers instruction. Ski and board rentals, Boyne Country Ski Shop, cafeteria, the Zoo Bar, NASTAR and special events make Boyne Highlands a fun place to be. What else is there to do? Zipline Adventures, tubing, dog sledding, cross country skiing, racing, snowshoeing, ice skating, horseback trails rides, groomer rides, Aonach Mor Moonlight Dinner on top of Boyne Highlands, and snowmobile rentals. So much to do! Relax in one of the mountain-top restaurants with a hot chocolate, cold beer and fueling food and take in the action of the many on-snow events offered at Boyne Highlands. 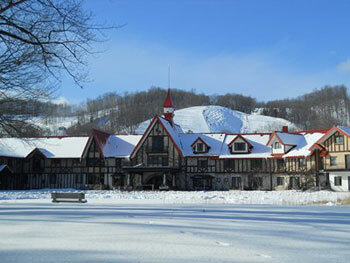 Bring the family or a group of friends and enjoy winter at its best at Boyne Highlands.